The Mercedes-AMG range extends further with the introduction of the CLA35 4MATIC four-door coupe; shares its underpinnings with the new A-Class AMG models. At the 2019 Geneva Motor Show, we got the first glimpse of the new CLA Shooting Brake. 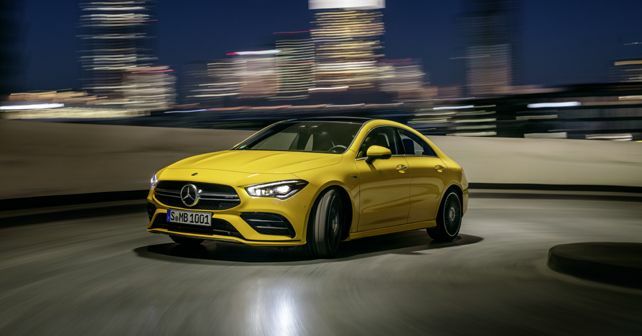 Now though, the tuning house of Mercedes-Benz has come out with the all-new AMG CLA35 4MATIC, which is essentially a larger and more exotic version of the recently-unveiled AMG A35 Sedan. Over the previous iteration, the new CLA35 is unmistakably different, thanks to all-new LED lighting units. As the moniker suggests, the new CLA gets the same powerhouse as the AMG '35' family, meaning that it is propelled by the same 2.0-litre inline four-cylinder motor with a twin-scroll turbocharger which powers the AMG A35 Sedan, putting out 302bhp and 400Nm of torque. With the 4MATIC All-Wheel-Drive (AWD) setup in place, power is sent to all four wheels via the AMG Speedshift DCT 7G dual-clutch gearbox. If done properly, the CLA 35 can do its 0-100km/h run in 4.9 seconds, just 0.1 second slower than the A35 Sedan. The AMG treatment on the outside remains identical to that found on the new A-Class models: An optional Yellow paint scheme, optional 19-inch wheels (18-inch as standard), a new twin-louvre AMG grille, blacked-out trim bits and a new diffuser insert at the back, flanked by two round tailpipe finishers on either side. If anything, the interior is more reminiscent of the A35 than any other element. As is the norm, the dashboard is dominated by the new MBUX infotainment system, which replaces the erstwhile COMAND unit. The fully-digital instrument cluster becomes a part of the 'Widescreen Cockpit' layout, as the two 10.25-inch screens are housed under a single glass cover. Further, the instrument cluster also features AMG-specific display modes, namely Classic, Sport and Supersport. The CLA 35 also gets an AMG-specific centre console with a standard touchpad, which has additional buttons that control functions like the ESP, manual transmission mode and the optional Adaptive Damping System. The MBUX system also features 'intelligent' voice recognition, which can be activated by saying the phrase 'Hey Mercedes'. Other upgrades include a new AMG Steering Wheel with additional Touch-Control buttons, 64-colour ambient lighting, five driving modes as part of the AMG Dynamic Select Drive and AMG Ride Control Suspension, which can be ordered with the optional Adaptive Damping System. The new Mercedes-AMG CLA35 4MATIC will make its global debut at the 2019 New York International Motor Show on 16th April and will go on sale in Europe sometime in August 2019.